2019 Events & Workshops are available! These unique Alaskan adventures are designed for folks seeking a vacation off the beaten path. Come experience the raw beauty of the Alaskan wilderness in one of the most remote and untraveled regions of the state. Stay on our remote working homestead for a unique getaway. Get a taste of the Alaskan Bush lifestyle firsthand and experience off-grid living on a modern Alaskan homestead. Your remote Alaskan adventure takes you beyond the reach of the road system. Here, wildlife abounds and the territory far less traveled. More than 150 miles from the nearest road, on the Western side of the vast and sprawling Alaska range is some of the most untouched and remote country in the state. 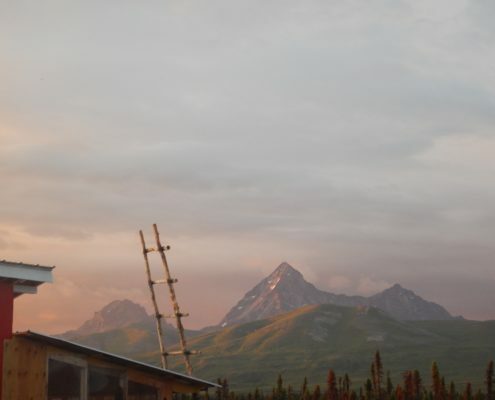 Under the gaze of unnamed mountain peaks, nestled between the flow of two creeks, and a world a way from the frenetic hum of human activity lies the Apricity Alaska Homestead. With guides Morgan Beasley and Margaret Stern. 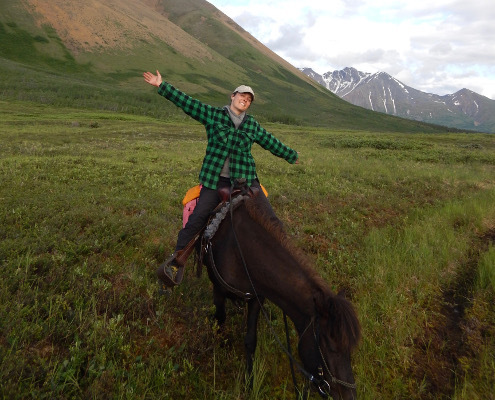 Enjoy the beauty of the Alaskan bush by foot or from the saddle of an Icelandic horse. Spend a day learning about edible wild plants or tracking. Hike along untouched creeks and eat from the garden. Experience the beauty of an off-grid Alaska wilderness lifestyle for yourself.